Common Core is crippling Roman Catholic schools in New York as they attempt to not only keep up with their own academic standards and spiritual development but also include the new controversial material of Common Core. "Right now, Catholic schools are still trying to figure out how they respond to the Common Core and how deeply they embrace it," said Dan Guernsey, director of K-12 programming at the Cardinal Newman Society. The focus, he said, has to remain on the development of students' "mind, body and spirit." Imposing constant churn and disruption on our most vulnerable students in the pursuit of higher test scores is not education justice. Worse, the relentless high-stakes-testing has served to re-inscribe inequality. According to Sister John Mary Fleming, executive director for education at the United States Conference of Catholic Bishops, "many parents are listening to the news. They see the political charge...What this situation has done is created an opportunity for Catholic schools to review our mission: What is our mission and how does the curriculum support that mission?" Yes, if lets say a family moves from one state to another, and the schools in which their children attended teach several different curricula, the child might have a difficult time, at first, adapting to the new methods, yet the opportunity to engage and adapt to a new style of learning is important and vital for critical thinking that will help them later in adulthood, since not everything will conform to them. Adopting Common Core doesn't guarantee all children learn the same or that they will be given a high standard to meet academically. If this Department of Education sponsored program were like a car, would one four-seat sedan adequately meet the needs of all people and accomplish what they need? No, this is why the American people have options when it comes to markets because everyone has a different interest and need they have to accomplish differently, which is why they have a marketplace of choices. 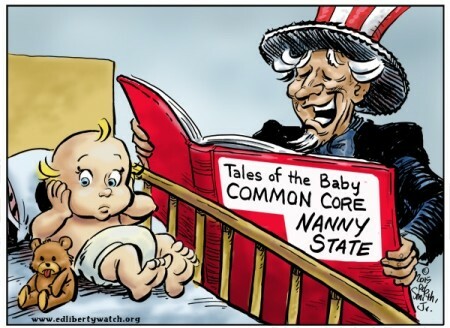 Sadly, Common Core is forcing parents to have their kids conform to a standard they are having a hard time escaping, standards that have caused people of all political stripes to realize that their kids are force fed sometimes extremely hazardous material. The Albany diocese's decision to re-evaluate their involvement with Common Core is going on at the same time as Gov. Andrew Cuomo's call for "a total reboot" of the curriculum, after New York joined with several other states with a populace highly rejecting the notion of an experimental and obviously progressive agenda . It was reported recently that a whopping 20% of New York public school students opted out of the mandatory math and English assessments last spring. This trend has been spreading like wildfire, though, and because of the hefty level of opt outs from students, more public schools are being threatened with severe budget cuts and other forms of punishment for a lack of test participation. What this incursion has shown is that no matter where you have your child go to get an education, these harsh progressive initiatives aimed at indoctrinating kids into a neo-socialist, relativist mindset. This "Obamacare" of education has shown a positive trend in the increase in homeschooling though throughout the country, showing the government and corporations backing Common Core that in a last attempt to draw a line in the sand, parents are willing to pull their kids out of the system in order to guarantee them a better educational opportunity in the long run. With Common Core creeping into the fabric of religiously based schools, how further will this intrusion go before these institutions finally say enough is enough?